The following recipe is one of the dishes of my last try-out. I made a zucchini and parsley soup. 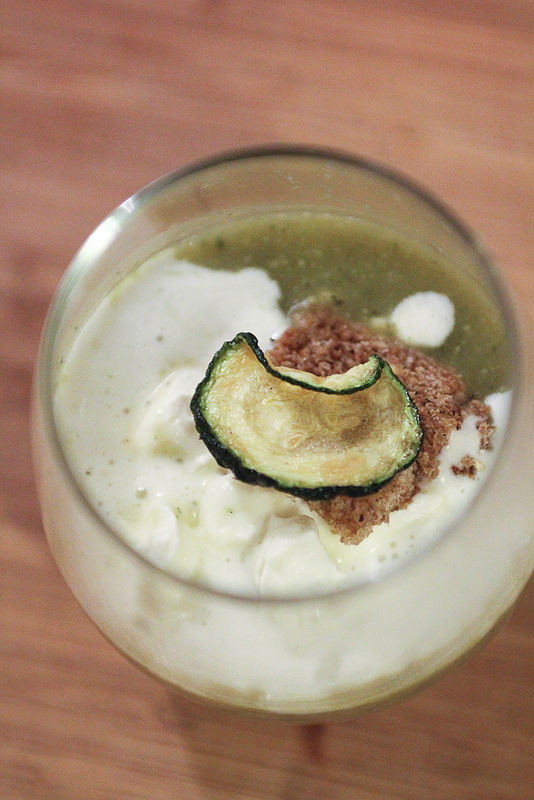 I finished the soup with creamy foam mixed with Pas-De Bleu, a little toast and zucchini chips. A big advantage is that you can make everything the day before, except the toast and the zucchini chips. However, these last two things you can also make before, e.g. in the morning or in the afternoon. So the only thing you have to do when your guests arrive is to heat the soup, to decorate the glasses and to serve your delicious soup. ** It’s a very strong blue cheese. You can replace it by other blue cheese like Roquefort. It’s hard to say how much you need. You have to try and taste it. Cut the onions and fry them in a bit of butter and olive oil while stirring, until translucent. Chop the zucchini and add to the onions. Fry it shortly, while stirring and add the vegetable stock. I used 1 L of water and two “Knorr Vegetable Stock Cubes with olive oil and sea salt”. Bring to the boil, turn the heat down to medium and cover. After a minute or ten, add half of the parsley. Let cook for about 20 minutes and then cut the heat. Add the other half of the parsley and let the soup stand for about five more minutes. Liquidise the soup in a blender or use an electronic hand blender. Feel free to force the soup through a sieve, and return to the saucepan. Taste the soup and add more salt and pepper if needed. While the soup is cooking, you can make the foam. Whip the cream with an electronic whisk until the cream forms a soft, shapeless peak when the whisk is lifted out. You don’t need to whip till you have a stiff-peak stage. (At this point, there will be a clearly defined edge left in the cream when the whisk passes through it, and when the whisk is lifted out of the cream the peak will have clear edges as well.) Mix the whipped cream with the blue cheese. Taste and add more cheese if necessary. For the toast, just cover some little four-square slices of bread with a bit of olive oil. Fry the bread in olive oil or butter and add the dried herbs, pepper and salt. The last thing to made are the zucchini chips. Mine weren’t perfect and not so healthy. It was the first I made it and just tried to deep-fry the zucchini. I think it’s better and healthier to follow the next recipe, but I still have to try this way of working. When your guests arrive, don’t forget to heat the soup. Add the soup in glasses, so they can see the creamy topping. Add this topping and finish with freshly grounded black pepper, the toast and a zucchini chip. Good luck!